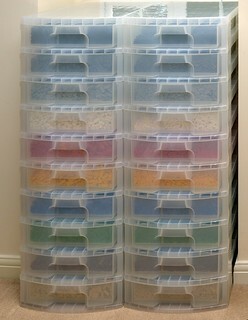 Storing and organising our LEGO are problems we all face and it can become a major headache as your collection grows. There seems to be very few products on the market that are perfect for the job and affordable in quantity so most of us make do with whatever we can find that's at the right price. 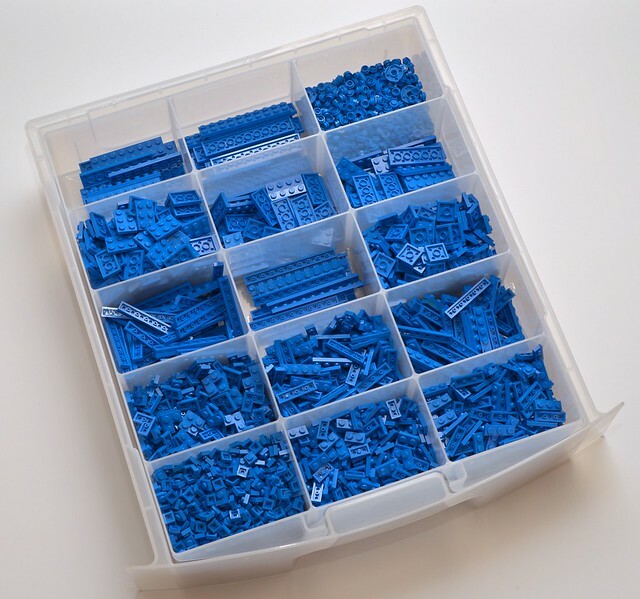 Recently there has been discussion in the forum about what an ideal LEGO storage system would look like and in it I mentioned that I was looking into acquiring some Really Useful scrapbook drawers, which are a relatively new product. I've now bought two so I thought it would be useful to post something here about them. Really Useful Products will be very familiar to those in the UK as a manufacturer of high quality and attractive plastic storage boxes in a wide variety of sizes. I'm sure virtually every AFOL in the country has at least one being used to house some of their LEGO collection. I'm don't know how widely available they are in other countries but the website does appear to serve a number of others. As well as the familiar boxes with lids held on by clip handles it also produces drawer systems that can be stacked to any height. Recently a new range has been introduced to accommodate the larger paper sizes typically used by scrapbookers (12" square, I believe) which doesn't fit in the standard range. What makes them particularly suitable for use for LEGO storage is that an insert is available that's the full height of the drawer which divides it into 15. Such an insert is not available for the standard sized drawers, the one available is only half-height, which might be suitable for some storage applications, but didn't suit mine. 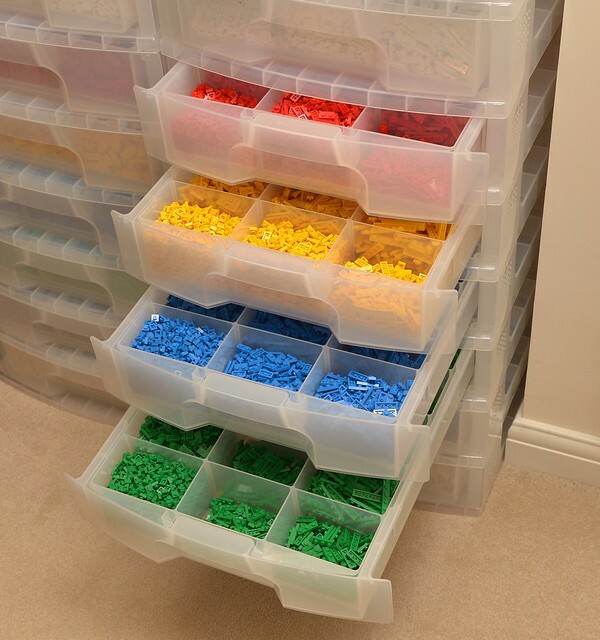 I ordered a couple of ten-high towers and inserts for every drawer in which I intended to store my bricks and plates in the 10 basic LEGO colours. With inserts they work out at about £10 a drawer which sounds expensive and soon adds up but when compared to the value of the parts stored within I think it's pretty cost-effective and money well spent. The dividers are fixed which has advantages and disadvantages, of course. On the plus side, it's impossible to accidently remove the one between the 1x1 and 1x2s which would result in a tedious sorting job, but on the downside they can't be reconfigured to accommodate larger parts. On balance, I'm glad they are fixed. The compartments are large and deep which is excellent for storing a lot of the same part but not so good for small quantities of different parts because it would be a nuisance having to dig around in them, potentially spilling parts over the sides, while you hunt for the one you're after. So, ideal for basic bricks and plates but not for, say, minifig accessories. Are they the last word in LEGO storage systems? But, the compartments are too large to effectively store a large number of different small parts. When retrieving parts you are not hindered by lids and don't need to pull the whole drawer out to get at them, which you do if using a tower of regular RU boxes. There's no end-stop or catch, so care must be taken when withdrawing the drawer fully to avoid dropping the contents on the floor. It's a shame that the compartments don't fit 16-stud long parts in them. So, no they are not, but they are perfect for some applications. They certainly fit the bill for what I use them for but I will continue to use my smaller drawers for specialised parts. However, if and when I can find space to squeeze a couple more towers in my room I'll buy them for slopes and tiles. If drawers half the height were also available, with inserts that divided them into 20 or so, Really Useful Products would have almost every LEGO storage eventuality covered. What do you use to store your LEGO? Let us know in the comments. Include a URL to an image or the supplier if you can. I Use Bito boltless shelves with RK Bins. I really like them because the come in two heights, two widths and can be divided with optional, removable dividers that can be slotted in seven (for 40 cm bins) places along the depth of the bin. Just reminds me how badly I need something like this...always hard to justify buying over more LEGO, which then exacerbates the problem! Really Useful boxes really are the best Lego storage boxes around! They're very well made and the smaller sizes almost seem designed for Lego. I store the RUBs in a set of 3-drawer cabinet things I got from ASDA. So the cost of those two towers was approx £200 in total? @ccjwprongs: Looks like it, but it depends on where they were bought. If you buy them from Staples or WHSmith (do they still sell RU products?) then you'll pay that much. As an example, the RRP of the 0.3 litre boxes is £1.21, but I buy them for 50p each. If that £200 is based on RRP then I'm sure they can be bought for much less. @MrFresh that is an impressive saving on the RUB prices! I wish I knew someone who could supply them locally to me for that kind of price. Oh yes! I need some of these! I am quite struggling with storage methods due to the size of our apartment. I paid about £200 for them both, from the RUB website. The inserts are pretty much a brand new product I'm told so shops aren't selling them yet. Also those that do sell the scrapbook drawers tend to sell the multi-colour version which I didn't want. You may well be able to track them down for cheaper, good luck hunting! One question I have is whether the stackable shelves have some way to affix ehemselves to the wall. If I stack them three high, I don't want them toppling over. Is being transparent a good thing so you can see what's in them or bad as parts could get sun damaged? No they don't but it would be easy enough to bolt a L shaped bracked to the top and fix it to the wall. I didn't mention that they are supplied with castors to facilitate moving them about, which I didn't fit, although with the weight of LEGO that would probably be hard to do on carpet particularly. Also thanks for pointing this out Huw as I need to start thinking about something like this. I currently use the Stanley sortmaster junior boxes, found them on a deal in Homebase for two boxes for £12. They are good as the dividers can be moved about to create difference size areas. Also stack together and can be locked together, only issue is when stacked together you can't see what's in any of them except the top one. Will be getting a system from RUB when I have room, the above system looks great. I just bought some of these using their "10% off until the end of June" offer - I haven't picked them up yet and I'm a little disappointed there's no stopper on the end of the drawer. I'm so gormless I'll be pulling the drawers out all over the place. Still, I use plenty RUBs at present right the way up to the largest size and I've always been happy with the quality. I was considering buying the 33-drawer tower and I almost pulled the trigger when these new scrapbook drawers were announced. They are expensive when bought at retail but there are some decent re-sellers out there if you look hard enough. I've heard tales of one that travels the car boot sales of Yorkshire who practically gives RUBs away but I've yet to track him or her down :) It has become legend in my family and all are on the lookout! Oh yeah, should add, thanks for the pictures of the dividers filled with Lego - I didn't purchase any of these and it's helped me decide that I really should. I use a lot of the smaller RUBs for bits and pieces such as clips and so on but I might have to take a look at these for brick and plate. Hobbicraft are worth keeping an eye on for these - not normally cheap (although the selection is good) but they usually have a 3 for 2 deal on RUBs every now and again. I've also found them in The Works (discount book shop) at a good price but only sporadically - I went back for more and they were gone! I just have a IKEA Billy Bookcase filled with Chinese Takeaway containers containing my Lego bits. These seemed like a fantastic replacement for the office supply drawers I've been using for years, until I saw there was no backstop. That's a deal breaker as I can be clumsy, and I have two children who like to look around sometimes. Also that price is insane. The office tower drawers I've been using are about the same size, have six clear drawers to them, optional castors, and the top can be removed and they can be stacked together. They were $20 when I first started buying them 12 years ago at Staples, and most recently I think the price has been $32. For smaller parts I've been using small Sterilite 3-drawer containers, which have no dividers and no backstop, but they are also stackable. Recently they changed the design - there's too much of a gap between the drawer and the unit, and they don't appear to be stackable. I got these for between $4 and $6. I have them stacked against the wall on the back of my building space for easy access. It seems like our options are becoming fewer and more expensive. I want to like these, as those dividers are excellent, but at almost four pounds just for the dividers, that's a little ridiculous. And no backstops on a stack of drawers of that size? Who are they kidding? That's double crazy. @Huw - I know of the cheap RUB's in Doncaster and buy all of my RUB products off them as their prices usually make RRP look silly. I'm a big fan of the RUBs myself. Like @ Adzbadboy I use the 'Really Useful Organiser Tray 4 Litre', but I store them inside the drawers of the £25 IKEA Helmer Drawer unit http://www.ikea.com/gb/en/catalog/products/10251045/ - each drawer takes two of the half height 4 litre tray, or one of the full height 9 litre trays ( http://www.reallyusefulproducts.co.uk/uk/html/onlineshop/rub/aTraySorting9L7Comp.php ) which I find really, well, useful. It also means I can move trays out to the boxes if and when I need to as well. I only sort by brick, and have found that the Akro Mils system meets the best balance of drawer size and cost. Each module is the same size so they are easy to stack, although they come in 24 (large drawers), 64 (small drawers) and 44 (mix of small and large drawer) configurations. The drawers are labeled with labels I designed to print using the Brother P-touch label printer. @Huw, I agree. I have spent a good amount of time trying to clean up. It all depends if you organize by color, or by type, etc. For example, my minfiure heads are in one bin, torsos and legs are organized by color, same with accessories, hats, weapons, etc. I blame my self proclaimed OCD! Where do I get those in Germany? Website says amazon, ebay and office shops, but none of these shops has those drawers. The bigger drawers are perfect for beams and panels, the middle drawers for gears, lift arms and other components I have a lot of, and the smallest for pins, axles etc. Absolutely perfect. Then I use Trofast from Ikea - http://www.ikea.com/gb/en/catalog/categories/series/19027/ for standard system Lego. These units are great as it gives a nice height work surface for me and my son to build on too. @taran2 - I have previously ordered RUBs from www.iwonatec.de but that was 12+ months ago so not sure what kind of range they carry now. Some really cool options out there (across the whole globe)! I get my kids to use tool/part "StoreHouse" storage containers from Harbor Freight. They are always cheap and available... I easily have over $200 worth of cases for the kids Lego's. This isn't the stack everything on the wall approach - but opt rather for moblility. My kids (6 and 3) can easily grab the case they want and see what is inside them. The individual bins inside are almost all interchangable (for 15 and 20 bin case) and you can easily dump pieces of of the smaller bins to sort (via sorting tray show above) and rearrange as the collection grows and shrinks with models/projects being built/displayed or broken down. The cases do stack up rather nicely; so it is a great thing to see all the Lego pieces off the floor and tables. Most of the solutions shown here you have to pick up pieces out of the trays once you find the tray you wan- OK for adults with a plan- painful for kids who want to discover the best pieces for their creations..
OMG, I want these but am in the US!!! Eventually I'm gonne sort all my pieces based on form and collour. Great review, I might switch... If I only had more money. I've been using Glis storage boxes from Ikea for some years now. Guess I have about 50 of them (and some Samla boxes for larger quantities). Yes, they have lids. But since I'm clumsy (and my Lego-room is just way too small) they have saved me more than once from having to sort things all over again. Big advantage : the dividers can be repositioned. So it enables me to adjust the boxes to my needs and I'm pretty sure it can fit a 16-stud piece (have to check). I've added some plastic clips (also from Ikea) that hold a card that describes the content. Can be adapted anytime. All in all, in spite of the boxes having lids, it works out fine for me. Just a little more handling. And lids are removable, but they are necessary for stacking them into a tower in order to save space. What I find very funny is, we collect plastic and then we need to buy more plastic to keep our plastic sorted! In SA we do not get the cool plastic you get! I bought a load of RUBs at a toy fair at Birmingham NEC last year, they were really cheap, a fraction of the RRP. I store all of my Bricklink store parts in grip seal bags, which are in then in freezer bags, then in IKEA Samla boxes stacked on IKEA shelves. I think opening all of those clippy boxes would drive me crazy! I do worry though that the chemicals in the plastic bags may be damaging the Lego. Does anyone know the best way to store sets? Maybe it's best to put them back in the bags and boxes that it's originally sold in? Mine are currently connected 15 short drawers high and I have 17 such towers. In places where separation is necessary, I've found a couple brands of small plastic boxes at Target stores in the US, two of which will fit into one Sterlite drawer, and those come with inserts with 6 compartments each. The inserts can be used by themselves, so I can divide a drawer into 2 large sections, 1 large & 6 small, or 12 small sections. Unfortunately I've not committed the brands of the small boxes to memory. After seeing this guy's website: http://agalkin.com/proj_chest.html I decided to go one better and make the same cabinet except three StackOn drawers high. Whenever I get it finished I will post in-progress and completion pics. Thank you everyone for the links and pictures. It's fascinating seeing how everyone else stores their bricks. Fascinating. $200ish for a set of drawers just for LEGO is a bit much, but I do like these. Tis easier to find the color from the parts than to find a part amid the colors. Akro or StackOn products are a much better fit. Easier to organize and label. Lots of really clever solutions in there, including some of the ones which were already mentioned in this thread. Recently there was a sale on tennis balls in Argos in Ireland and I got 24 cans of tennis balls . ^^ Very useful, thanks for the link. I use 9l and 4l RUBs in Ikea shelves, which I love, its really flexible but is not earthquake safe and its slower to use than drawers. If they joined them more solidly plus some kind of drawer stops for use in earthquake prone countrie, and added the same range of inserts as for their 9l boxes then I'd probably switch to these. I spoke to my friendly RUB supplier today! She was very happy to hear that Lego fans like the RUBs, she's tried many times to contact the community (not sure which ones though). I asked about the storage drawers on this page but it looks like it will be a while before she can get them, I think the larger chains get priority. I have her mobile number if you want to contact her, though there is a number on the facebook page. She does travel around the country to various fairs, markets and expos, so if you want a lot of stuff you might be able to arrange a meet. (I'm not affiliated in any way with her, I've been buying from her market stall for about a year and I've always been given a good price. I'm not on commission, just wanted to share it with you).